I tend to ask myself this question after a full day's writing and I only managed to crank out 500 words. I think I write for different reasons depending on the type of writing. I think I write fiction as a sort of creative compulsion. Of course I'd love to be published, write a bestseller etc etc but most of the time what gets me to put fingers to keyboard is a need to make sense of a story that I already have formed in my head. I also write as part of my day job but it is a very different endeavour. Here I write because I want to publish findings of my work, because it's expected of the industry and because I want to connect with colleagues doing interesting work in the field. Finally, I recently started up a new blog, which I also think is borne out of creative compulsion but also out of a desire to connect. I often have thoughts related to issues that are not strictly storytelling and not work related and the blog is an effort to take part in a larger discussion where I have the freedom to say whatever comes to mind. I can imagine that the desire to be heard is a motivating factor for many writers. Caroline, thank you for sharing! 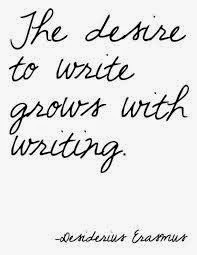 Do you write for enjoyment daily? Are you able to carve out the time? Be sure to add a link to your blog above by clicking the blue button. So glad we connected. Lovely. Your words are truly inspiring. I would love to read your blog. Thank you so much!! Thank you for stopping by . . . Do you like to write? Yes.but not on a regular basis. My bad luck is that usually,i do not get that much amount of time from my job so that i can contribute my self in the writing field. Having said that, I am an avid reader and whenever i get my free time, i read. Now-a-days, I am reading some of the greatest short stories written by world famous authors like O.Henry, Guy De Maupassant, Khalil Gibran and many more. I would love to contribute my self in the fields of writing and reading. Thanks!